De Blob meets Batman in the Dark Void. That sounds more like an upcoming movie or remake of the classic 1960s TV show instead of upcoming new releases from some of the gaming world’s powerhouse suppliers. 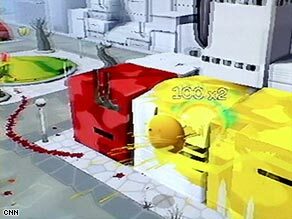 "De Blob," from THQ, will bring color and music to a world made in black and white by the I.N.K.T. fortress. This exclusively designed game for the Wii features a creature who colorizes the screen in bright paint and brings happiness back to Chroma city. Designed with the whole family in mind, "De Blob" will brighten store shelves this fall. Meanwhile, Batman, Superman and all the DC Comic characters arrive in cyberspace for battles against their dreaded enemies. Sony Online Entertainment announced a plan to have you become your favorite superhero or special villain by creating a character to match powers and wits against DC Comics' best. This massive multiplayer online game (MMO) continues to develop and should hit the gaming community in 2009. Of course, if Superman’s flying skills make you jealous, the hero in "Dark Void" by Capcom makes up for his lack of genetic flight by strapping on a jet pack to take his fight to the skies. Vertical fighting in 3rd-person shooter adds another plane to the usual forward, backward motions. Whether you’re blowing up droids or capturing starships in flight, the jet-packing hero takes his fight to new heights. While E3 continues to spread music and lower prices in big gaming consoles, there have been no giant surprises yet. However the old adage may still hold true: good things come in small packages. *Yawn* Wait, were you covering E3? This sounded like you went to IGn or something and just poked your head into some forums. After the City of Heroes and City of Villains, is the world really ready for another superhero genre MMO? Too bad SOE will manage to totally mess it up, no matter how surefire the franchise may be (i.e. see SWG). I'm not a gamer, but you make me want to become one.